Art can be a great way for kids to create and learn by using their senses. There is so much sensory input that happens with art creation! Sticky glue, the scent of paints, tearing paper, cutting resistive materials…art is a sensory-filled experience! 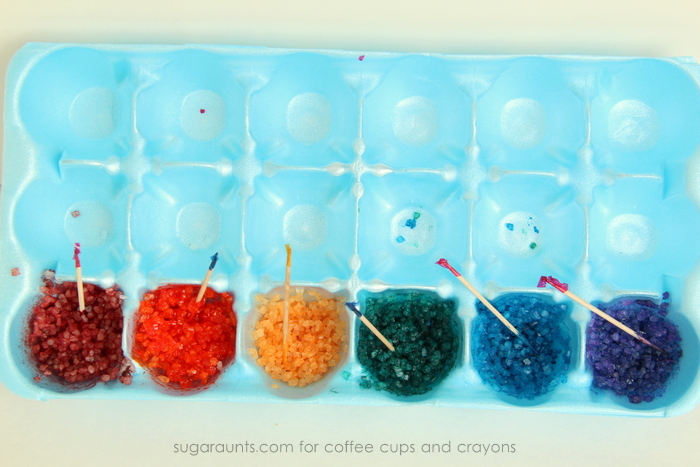 This Scented Sensory Rainbow Art project provides even more sensory fun with DIY dyed bath salts. The scent of coconuts washed over us as we created, and wow. Was this art project ever fun! 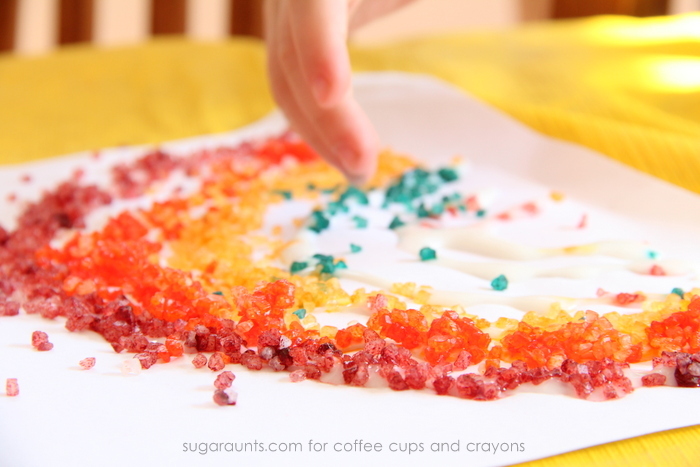 Create scented bath salts for a sensory rainbow art craft and fun with the kids. Liquid food coloring (We trialed two other types of dye for this project to see what would work best for coloring the scented salts. The gel food coloring did not allow for a bright red. The orange gel in the tube made the salts too sticky. 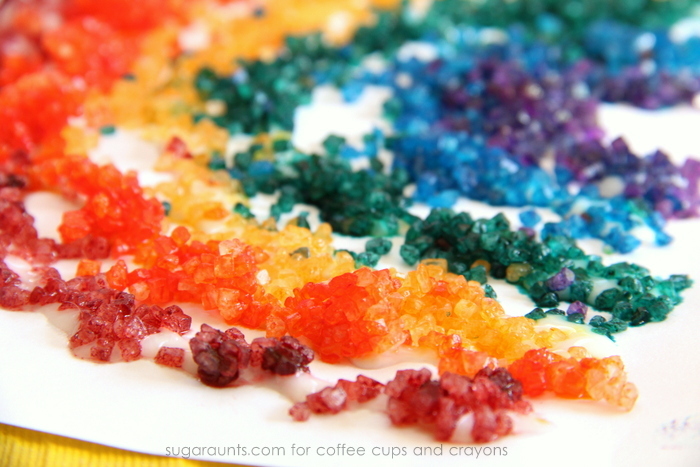 I would stick to liquid food coloring or liquid water colors when making these colored salts. 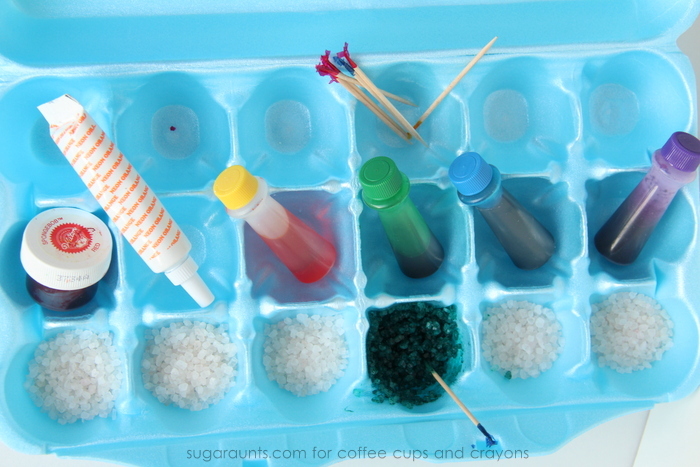 Add a few drops of coloring to each section of salts. Stir the salts with the toothpicks and let the salts dry. We let them dry overnight. 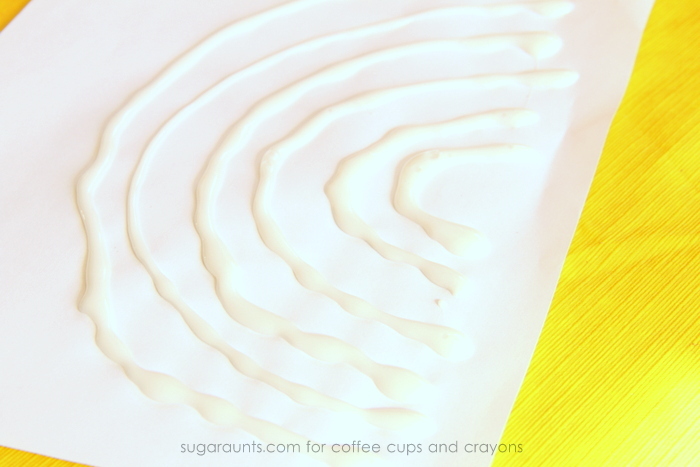 When you are ready to create, draw a rainbow with glue. Start sprinkling! 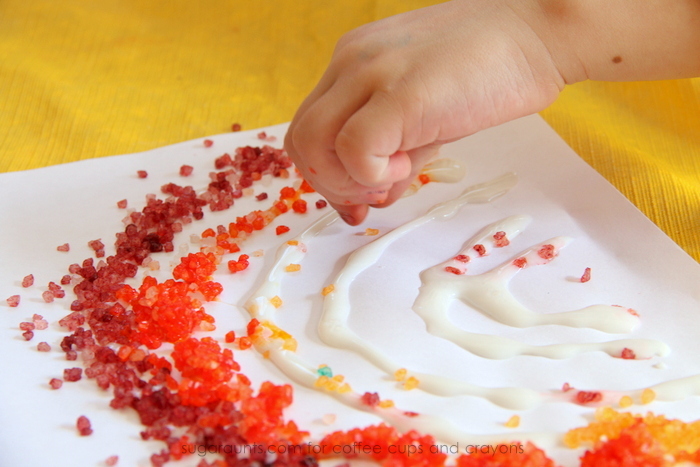 Pinching the salts uses a great tip to tip grasp (pincer grasp) and is wonderful for fine motor skill development. 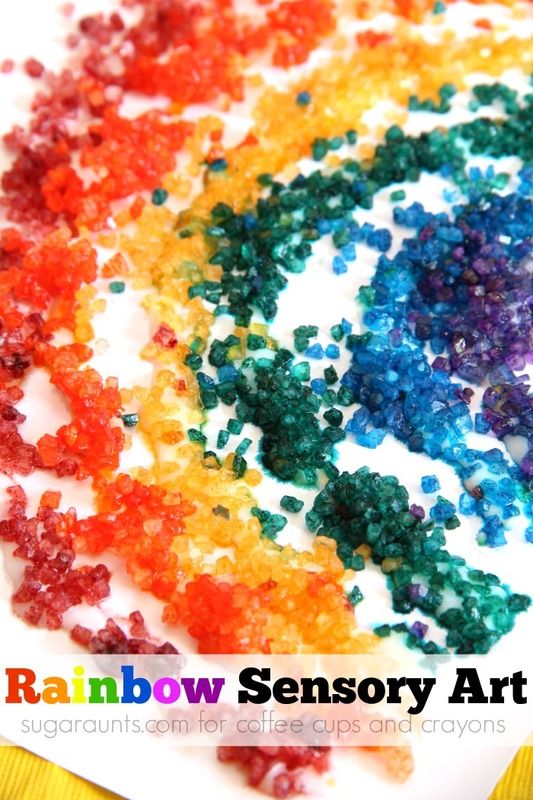 Sprinkle the colored salts in rainbow order and talk to your child about color identification, rainbow order, and ROY G BIV (Red, Orange, Yellow, Green, Blue, Indigo, Violet). The colors and scents of this scented art activity was very fun for us! Be warned, the use of food coloring will dye fingers, too. We ended up with green and blue fingertips even after letting the salts dry overnight. Using liquid water colors would work better. all things creative in motherhood. They love playful learning, creative kid’s crafts, sensory and fine motor activities, kid’s party themes, DIY, and so much more. Between the three Aunts, there are 6 cousins (with more on the way!) who are around each other so often, they are more like siblings than cousins! You can see the action at www.sugaraunts.com. Follow along on Pinterest, Facebook, Google+, Twitter, and Instagram.